Hi everyone! You know how it is, you go onto Pinterest looking for that recipe you wanted to try and get distracted by EVERYTHING. Especially quilt-related tutorials, in my case. 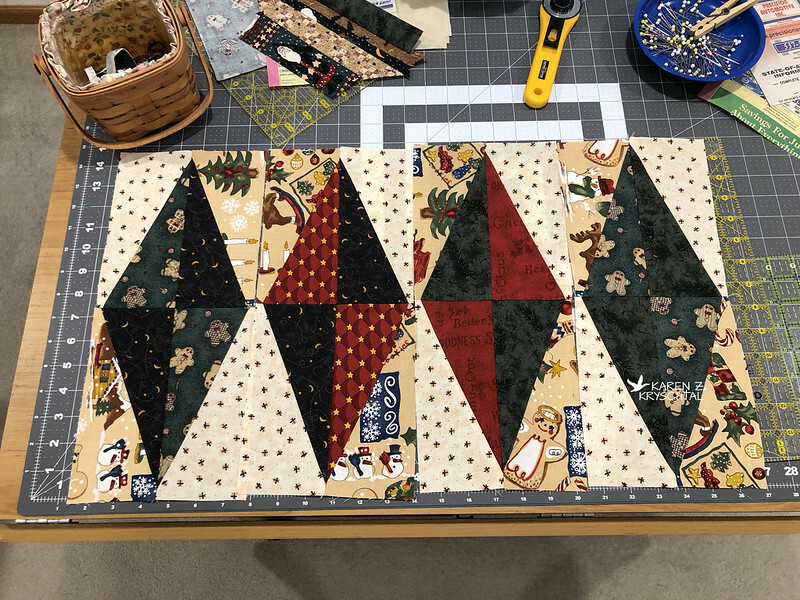 When I was making one of the bird blocks, I thought I'd elongate the body by doing half-rectangle triangles (HRTs) instead of half-square triangles (HSTs). What a FAIL. Then came my Pinterest session ... and I saw tutorials for HRTs, touting how "easy" they were if only you made them "this" way. I had to try! I tried the one at this link first. 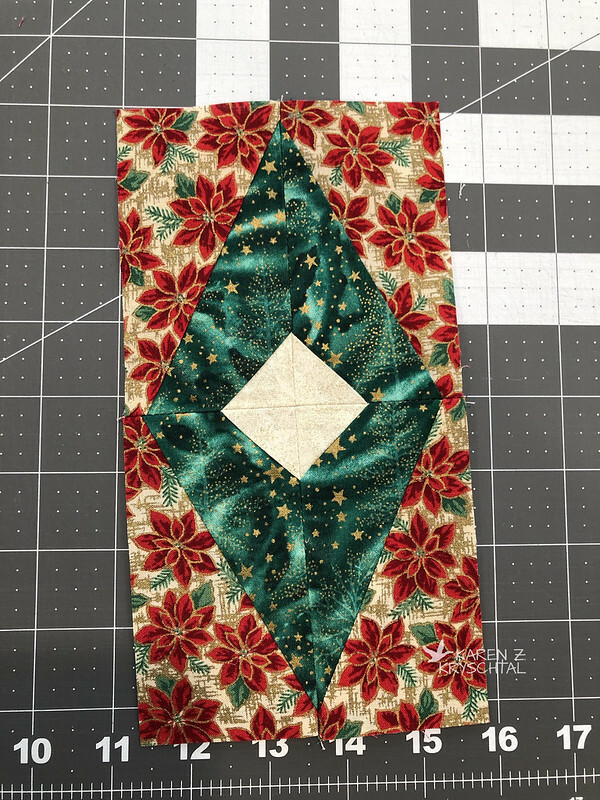 I thought I had a bunch of 10" squares in Christmas fabrics that I could play with. Rather than re-read the tutorial, I thought I remembered the cutting directions just fine and started. Only I cut wrong. It really shouldn't have mattered - as long as I had rectangles. Right? ... but really, it's a pretty good tute. I just messed up. Following the directions might have helped. Ha ha ha. For a first attempt, though, they aren't too bad. Side note: Yes, if you look in the background of the shot above, you can see what else I've been playing with. 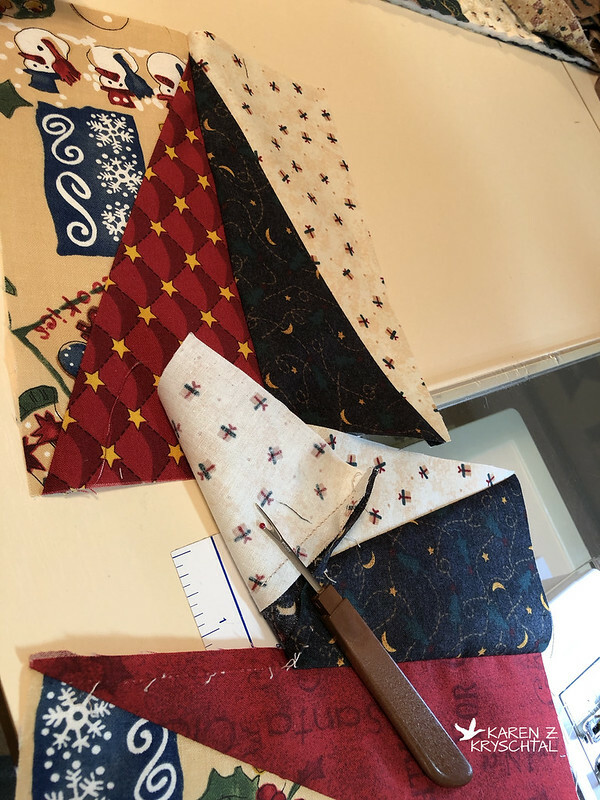 Since I dug into the Christmas fabric, I realized I have a ton of scraps I need to use up there, too - so I started a paper foundation/phone book quilt. I've got to use things up!!! Anyway ... then I stumbled onto another HRT tute, done quite differently, and with a sweet, little twist! You can find it at this link. She gives very thorough instructions, to include which way to press your seams, so they snug up nicely. She also gives directions if you have a specialty ruler AND if you don't. Very nice! Isn't that on-point square in the center a fun touch?! You could easily leave that out, but it adds even more panache, if you ask me. I do have the specialty ruler she used. It really helped with the squaring up process. Or is that "rectangling up"? Your HRT's are looking good. That Pinterest or even just Googling can lead you down so many rabbit holes. Love your first block! The colors are so striking! Thank you for stopping by; please leave a comment! Please visit my Siberian Huskies' blog!